Dan Kelly is flat-out killing it during the first week of the 2013 World Series of Poker. Kelly burst onto the live poker scene following his $1.3 million win in the 2010 WSOP $25k 6-Max No Limit Holdem tournament, and it looks like he may be on the verge of a true breakout year if he can keep up is early pace throughout the 2013 WSOP. So far at the 2013 WSOP Kelly has final tabled Event #2, the $5,000 8-Max No limit Holdem tournament, where he finished in 6th place, and now the online tournament legend (just Google DJK123 if you want to see an online poker resume that will make your jaw hit the floor) is making another deep run in Event #6. He is also in the $1,500 Millionaire Maker tournament, where he currently sits in 14th place with 133 players remaining. 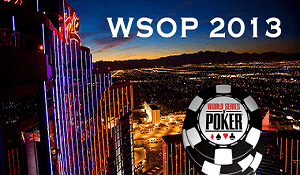 Already guaranteed his second cash of the 2013 WSOP, Kelly is on pace to have one of the better WSOP tournament series in the history of the game –provided he can keep it up of course. As it stands right now, Dan Kelly has nearly $2.5 million in career tournament earnings in live poker tournaments (most of that coming from his WSOP win as well as a 2012 WPT final table), to go along with his near $6 million in online winnings.